Every morning, hundreds of fish bike sellers go around suburban Kupang. Locally known as papalele, they bring fish from the market to consumers across the city out of two buckets latched on to the back of their motorbike with a wooden frame. The buckets are without lids, directly exposing the fish to the scorching sun of East Flores. In early 2017, a team from Kopernik and Mitsubishi Electric Industrial Design Center interviewed fifteen papalele in Kupang to assess how we could develop a technology that would improve their daily livelihood as part of Mitsubishi Electric’s Small World Project. One challenge shared by the papalele was how difficult it is to maintain fish quality, mostly because the only method currently used to preserve fish is by putting ice blocks on the fish bucket. 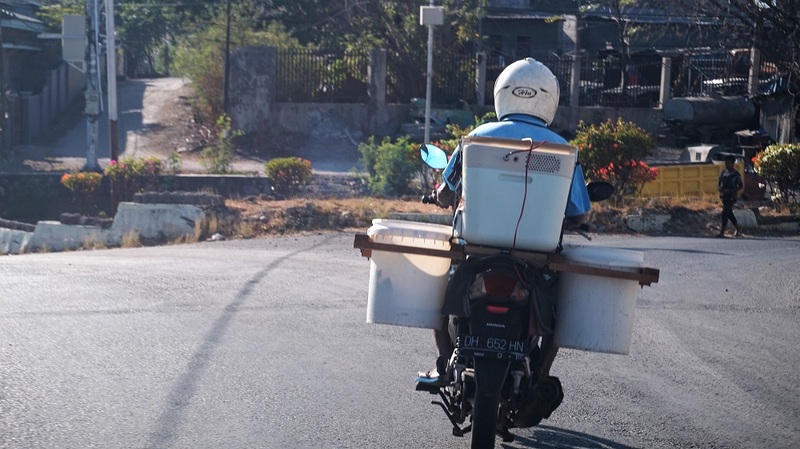 The ice keeps the fish from spoiling only temporarily, as the Kupang sun can heat up to almost 36 degrees Celsius at midday, melting the ice blocks and impairing the quality of the fish. This ultimately leads to significant opportunity cost for the papalele. As consequence, all fish products have to be sold on the same day of their purchase, limiting the sales time to a narrow window to avoid spoilage. In addition, because the quality of the fish available in the fish market is not a consistent standard, the papalele must consider the amount of fish they sell for the day, leaving them with little choice to expand their businesses. This scenario places papalele, who are already lower income earners, in a challenging situation. If they buy more fish from the port than what they can sell for the day, they will lose money. If they buy too few, they won’t see much profit. And what do you do with all the fish that have not yet been sold? Will they have to be sold at a cheaper price? Or do they get thrown away? If so, how do you compensate the losses? These were the questions Kopernik and Mitsubishi attempted to tackle in our effort to improve the temperature-controlled supply chain, or cold chain, of the fishery sector in Kupang. We believe that helping small-scale papalele to find a better way to preserve fish could enable them to prolong their sales duration and maintain the fish quality. Based on our interviews with the papalele, we learned that the underlying issue appears to be a lack of modern fish preservation systems in the area. One solution that could bridge the cold chain gap between the papalele and consumers are compact off-grid fridges. 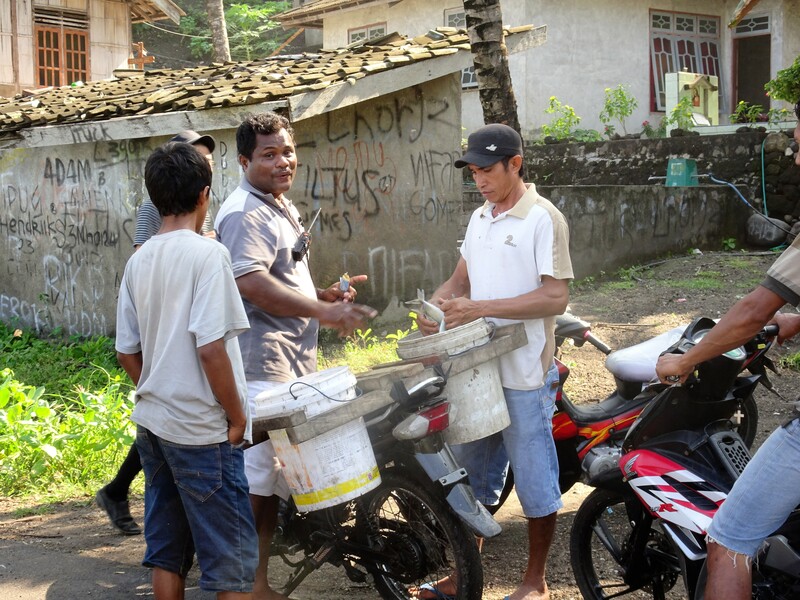 The papalele could attach these compact off-grid fridges on their bikes, along with their buckets, and safekeep the fish at a controlled temperature. Through a series of trial and error in our prototype testing phase, we saw the use of compact off-grid fridges starting to reshape how papalele encounter challenges in maintaining fish quality. They were able to travel further in their sales as the compact off-grid fridges kept the fish fresh, allowing for greater opportunity to increase their income. In the spirit of finding what works, the nascent progress we saw in this particular technology intervention is the first promising step in the journey of human interaction with a harsh environment. As we learned in this project, finding effective solutions to the challenges faced by last mile communities means working closely with local communities and technology developers to tailor adjustments that address local needs, perspective and tastes. Until a more modern and organized preservation system is in place, our next step is to find the appropriate technology and its domestic adaptation to improve the livelihoods of people in remote and hard-to-reach areas such as East Flores.